Organisms produce a large volume of carbonate sediments, so it is important to know what is living in different carbonate environments. James Bishop has assembled these links to the organisms he observed in areas where he collected the Bahamian sediments you look at in this lab. Use these photos to help you interpret the sediments. · Mollusk (clam) **Scroll to the bottom of the page. The last four photos of shells are examples of this type of organism. This is a living (or recently living) coral with dark spots disease. This coral is colonial, with a coral animal living inside each little cup-like polyp on the surface. Coral sediment often appears porous due to these little calcareous cups or polyps. This site has some lovely photos of corals (the 3rd, 4th, and 5th photos). Diadema are black sea urchins which have calcareous spines that can be reworked into sand. Diadema themselves also excavate into hard surfaces, breaking down reefs and hardgrounds into sand. Homotrema rubrum is an encrusting foraminifera. It can be reworked into carbonate sand grains which are often colored pink. Scroll down to Figure 3. There is also other useful information on this page about reef-forming organisms. The following 4 photos links are for calcareous green algae which are rooted into the sediment and disaggregate into carbonate mud. 1. Penecillus looks a bit like a paintbrush. 2. Rhipocephalus looks a bit like a pine cone. 4. Acetabularia attaches itself to firm substrates, such as hardgrounds and reefs. Seagrass meadows (here comprised of Thalassia) can baffle wave energy, allowing for the deposition of muds and creating environments favored by foraminifera, snails, and clams. 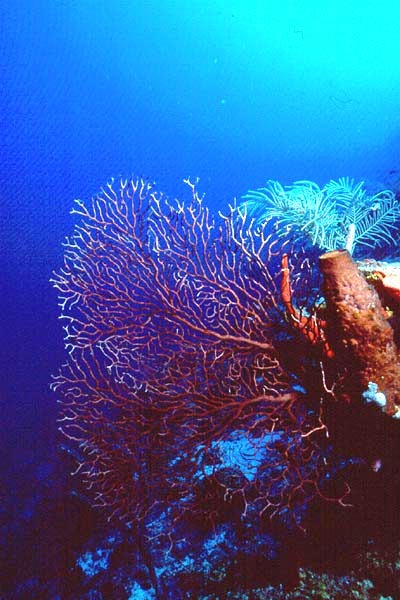 This sea fan is a soft coral or Gorgonid , which has neither a calcareous skeleton, nor photosymbionts. Gorgonids like to attach to firm substrates with high energy, such as reefs.